Our green Cat6 solid Ethernet cable is designed to meet local requirements for networks in commercial buildings. This 1000-foot Plenum cable is rated for use between floors and above ceilings. It has a fire-retardant plastic jacket to reduce the chances of flames spreading in these areas. 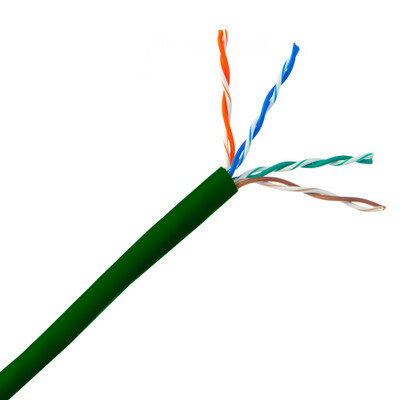 The Cat6 UTP Ethernet cable uses 23 AWG pure copper conductors and exceeds EIA/TIA-568-C speed and cross-talk standards. This pull box of green Cat6 Plenum cable makes it easy to set up a fire-resistant network or phone infrastructure.